The house: Remodeled part of 16th century monastery with central heating and AC, in the heart of Cannaregio, near Ca'D'oro and Santi Apostoli, between Strada Nuova and Fondamenta Nuove. Central Location: on foot 5 min. to the Rialto Bridge and 12min. to San Marco. Very quiet and safe! The apartment is on the 2nd floor (in Europe 1st floor) with very easy flight of stairs. Each room is independent and you access them all through 5 doors in the entrance: the main bedroom has a kingsize bed and 3 windows, the living room has 2 sofas and 3 windows on canal, sit-in kitchen with window on canal, bathroom with window, washing machine, air conditioning and central heating. You do not need to pass through any room to access the kitchen and the bathroom. We rent our lovely, bright (total of 9 windows), quiet, and comfortable flat for weekly stays all year round, preferably from Saturday to Saturday to 2 or 3 people,but can sleep 2 couples. Between January and March we make specail offers for long rentals, please get in touch. You can experience Venice like a real Venetian and have a unique, charming approach to this wonderful city which is still very lively and human. The perfect central location just off the tourist track, the view from the many windows overlooking the Canal San Andrea (see photos from the different three living room windows), the wooden beam ceilings in the living room and in the kitchen, the charming main bedroom, the functional bathroom with cabin shower and washing machine, and the elegant furniture make it a special place. There is also a small second bedroom if 2 guests prefer separate rooms or for a 3rd person or a couple. In 2008 we added air conditioning to offer refreshment during hot summers. For those who don't like it we have very good fans and if you keep the shutters closed when you are away the apartment keeps cool anyway. Local shopping is great. We suggest you take the gondola ferry 'Traghetto Santa Sofia' 2 min. to the Rialto Fish and Vegetable Market where you can buy the best fresh food in town, also recomended a grocery supermarket at San Felice, 3 min. away, open all day seven days a week and the best typical restaurants happen to be nearby just off Strada Nuova and then along the Canale Misericordia, a few minutes from our a little more central area. The neighborhood is very lively, safe and central. In two minutes you can reach the nearest boat station Ca' D'Oro (10 min. boat ride to the train station and 12min. to Piazzale Roma-link to the mainland and airport) and just one minute from the flat you can find the best and most typical venetian 'cicchetti' at local Baccari and restaurants nearby. From the near Fondamenta Nuove you take the boats to the Airport, to the wonderful Islands of Torcello, Murano e Burano and to the famous Lido with the glamorous hotels and beaches (Visconti's Death in Venice, Film Festival, etc.). Usually no pets. The flat is on the second floor (Europe first floor) therefore even if there is no lift you just have to walk up only 16 comfortable steps . Smoking is NOT allowed inside! Please take a walk if you cannot resist. Note: We rent it WEEKLY in the frame Saturday to Saturday. It is our second home, we and our friends and family are also often there on holiday, and this helps keeping the apartment always in its best efficiency as we keep improving it and doing repairs during our several stays all year round. But do not worry, there are no personal things around and the wardrobe and the shelves in the bedroom are at your full disposal. As I wrote we are also on holiday when we are there and come with our suitcases as you do. Rates during Carnival, Easter, New Year's Eve, Biennale and peak weeks are higher. Discounts are offered for longer stays (two weeks or longer) especially in the low season. Special last-minute offers may be available to fill in open dates. For those who fear ACQUA ALTA: do not worry, it is a tide, not a flood, and as it comes in our street for a few centimeters it also goes away. San Marco is one of the lowest area, Strada Nuova is pretty free of 'acqua alta'. We monitor the tides and keep you informed when it is higher than usual. We provide a choice of brand new rubber boots so that you can explore and have fun and experience something unique. It is not a danger for tourists. It is hard and sad for the people and shops on the ground floor. The city of Venice is doing major works in all canals to improve the ecology and the solidity. We kindly ask our guests when back home to write a comment in the vrbo/homeaway guest book. Most tell us on the phone or by email how charming and comfortable it is but we would like also other potential guests to read it. Thank you! We can talk on the phone about details, but please first write an email with your landline and we are happy to call you back. If we publish our phone we are flooded by calls from other websites offering us their service. We are a couple involved in the arts and culture and love Venice and its Lagoon and we are happy that our guests can share the experience when we are not there. We chose this area (Ca' d' Oro - Santi Apostoli) as it is one of the most TRUE part of central historical Venice. It is very close to all tourist destinations and transport facilities, but at the same time safe, quiet and most human. Staying in our apartment in the very heart of the old center allows you to experience this unique city like a real Venetian with all comforts for a memorable holiday. Venice is built on water but not all houses see it…we do from our windows! brand new, silent and efficient, BUT if possible not to be left on when away from the apt.! New machine with a splendid Rapid program, ideal for our guests clothes, NO house laundry washing, we do it! only available on request for longer stays, Venitians hang their laundry on the lines and in winter we have a foldable liner for inside. with 2 sofas, 1 armchair, 2 chairs , one writing desk, books and above all 3 windows on the charming Canal SanAndrea. You can enjoy the reflections of water on the ceiling while resting on the sofas! Different styles: with filter n.4 or Bialetti espresso in 2 sizes, instant, etc. Plenty of books in many langauges, mostly English, but not only, and many Venice guides and maps. Our 10-day October stay was wonderful. We found the apartment comfortable, spacious and well equipped, the kind of place where you can spread your stuff out and make it a "home away from home". Excellent wi-fi, lots of hot water and good heating for the October nighttime chill are among the many features, all as advertised. Superb location too, away from the crowds and yet within quick easy reach of all attractions. We zipped around on the over-crowded vaporetti (the 7-day pass at €60 pp a great value) like we'd been doing it all our lives, each ride a tour in itself. We also rode the traghetti several times (standing up! ), and of course did a ton of walking. Then, after a hard day at the Accademia, the Isola San Giorgio or perhaps Murano-Burano or the Lido, we'd wander home to mercifully quiet Cannaregio and cook dinner from provisions picked up at the nearby Conad supermarket. Then we'd drift off to sleep in our comfortable bed to the lapping of water in the Sant'Andrea canal. That became our pattern. Busy days sightseeing, usually with lunch grabbed at a bar or osteria somewhere along the route, perhaps a plate of tramezzini (just like Guido Brunetti) or a sit-down plate of pasta and mussels and a spritz at the Bar Puppa, our own local discovery just near the apartment, en route to Fondamente Nuove. Then a quiet evening at home, as most 70-somethings like to do. On several occasions, beautiful piano music came drifting across the canal from the Palazzo Albrizzi, which we found to be a kind of arts centre. We actually attended a recital there one afternoon. Our big cultural "night out" was a performance by Interpreti Veneziani, an outstanding string orchestra that dished out some sizzling Vivaldi and somehow made it fresh, even though they do it every night. Venice has changed since our 1987 visit. Way too crowded. But still magic. We'd be back in a heartbeat. And this apartment definitely makes it doable. Thank you, Elisa and Hans. The accurate description of the plus of our place as well as some tips for future travelers and the warm appreciation of such a wonderful couple is really a beautiful reward for our committment to our guests,Thank you and of course we are looking forwrd to welcoming you soon again. My wife and I had a delightful week in Venice staying in the apartment. 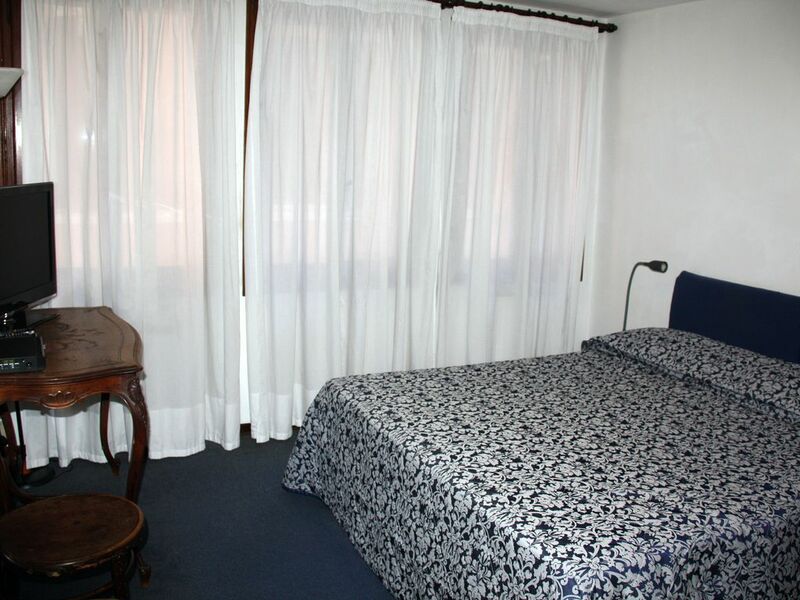 The apartment is well located, clean, quiet and very comfortable. The hosts are warm and welcoming. All water and sport activities find place at the Lido which is easily reachable with a 25 min. ride with waterbus. NEW Available: a light to carry beach ombrella and two folding straw beach mat, to be used with beach towels .